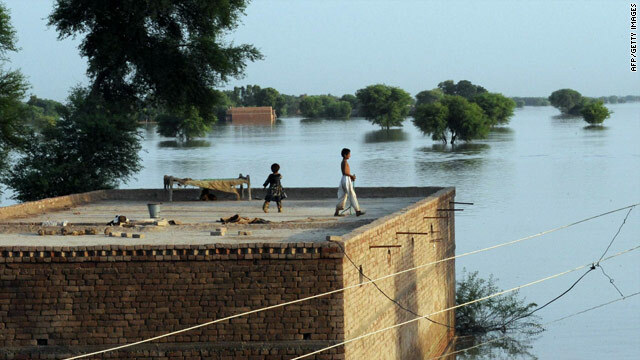 As a number of bloggers have noted, the 3 million people left homeless by recent severe flooding in Pakistan have been all but neglected by the media and by the general public. That number is staggering — it’s about equal to the total population of San Diego, CA. The kind of overwhelming, heartfelt response that we saw in the aftermath of this year’s earthquake in Haiti and other natural disasters of recent years has been missing. The International Rescue Committee, founded by Albert Einstein in 1933, is on the ground assessing the disaster, planning to make clean water accessible and to provide shelter to people who have lost their homes. To donate to the IRC’s efforts in Pakistan, click here. The International Medical Corps (IMC) has sent mobile medical teams of doctors and paramedics to assist victims in the hardest hit areas of Khyber Pakhtunkhwa Province in the northwest. To make a donation to the Santa Monica, Calif. based organization, founded by a UCLA doctor, go to the IMC website. The organization is also seeking doctors, nurses and trained professionals from a wide variety of fields. For more information and to volunteer, visit the Corps’ website. Mercy Corps‘ Pakistan Emergency Fund supports Mercy Corps workers with their efforts in helping displaced families in the hard-hit Swat Valley. Visit the Mercy Corps website to donate to the Pakistan Emergency Fund. Oxfam hopes to reach 400,000 people affected by the devastating floods, supplying clean water and preventing the spread of waterborne disease. To support Oxfam’s efforts, go to the Oxfam America website. Those outside the US can donate to its UK emergency relief fund for Pakistan. Hillary Clinton announced Wednesday that Americans could text the word “SWAT” to the number 50555 to donate $10 per SMS message to the UN High Commissioner for Refugees to provide tents, clothing, food, clean water and medicine to Pakistan. The World Food Programme, the world’s largest humanitarian agency fighting hunger, is supplying food to the tens of thousands affected by the floods. To donate, visit the WFP website. Posted in Bodhisattva Action Alert and tagged Pakistan. Bookmark the permalink. Thank you for this, Maia. The silence is truly deafening. The Pakistanis have proven to be something far less than America’s allies; why would anyone think we’d care that much about what happens to them? I was just browsing the Buddhist blogs (got here from Dangerous Harvests) and came across this post. I think it’s the first time I’ve seen a list like this of all the ways to help the people suffing through the disaster in Pakistan. The only thing I’d add, though, is that whilst it’s good and proper to help the victims of these floods, if ever there was a time to add conditions to aid, this is it. I mean, the people of America, Britain, and Japan (the top three donors) are being incredibly generous both through their tax money and private donations, and I don’t think it would be too much for them to ask the Pakistani government in return to (a) start combatting the Jihadists they seem to protect (b) stop the persecution of Christians and other minority groups (c) do something about wonen’s rights and other basic human rights in the country and (d) get rid of their nuclear weapons. A step in any of these directions would show the world that Pakistan is a country to be trusted and that the aid donated to the country would stand a better chance of doing some good. All the very best in your fundraising and thanks again for this resource.